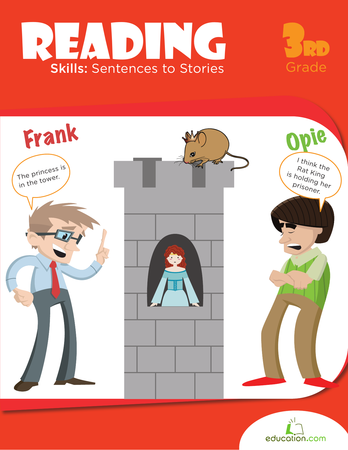 Students will be able to identify the moral of a simple story, as well as some traits of its characters. Hold up The Wretched Stone, and ask the class if they enjoy mysteries. Let them know that this story is a mystery told through entries from a captain's journal. Ask students to pay close attention to the characters in the story, as they'll later be asked to explain the characters' feelings and motivations. Explain that by paying close attention to the characters, they'll be able to notice Character traits, or words that describe how characters act. Some examples that you could give are: calm, sneaky, and enthusiastic. Read aloud the beginning of The Wretched Stone. Ask students to discuss the feelings of the crew with a neighbour. After about two minutes, have them finish up their discussions. Call on volunteers to share what they discussed. 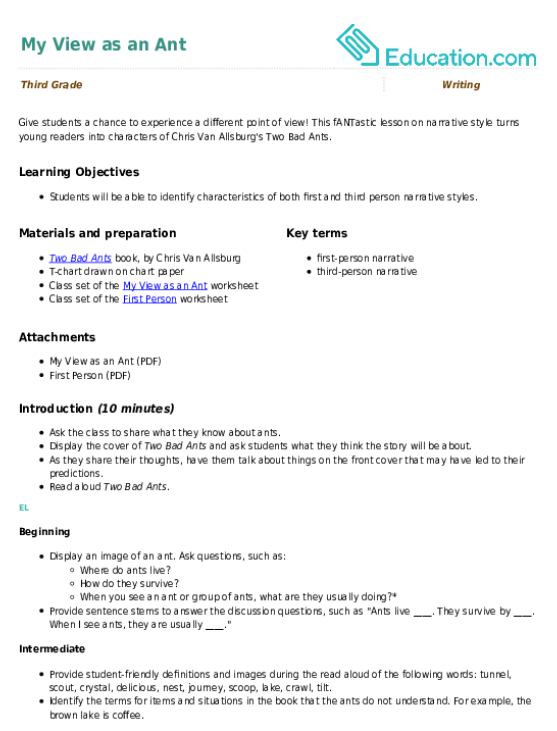 Continue the story, pausing occasionally as you go to ask students questions about characters' behaviors. Some examples are: What motivated the captain and crew to bring the mysterious rock aboard the ship? What evidence from the text show the crews' behaviour changing in the middle of the story? Why does the captain decide to hide the rock? After you finish reading, display the following question on the board: What is the Wretched Stone? Distribute a sticky note to each student. Have students write down their answers on the sticky notes and paste them to the board, underneath the question. Group together similar answers to get a clearer idea of how students responded. After going over some suggestions, reveal that the Wretched Stone is actually a TV. Ask students what they think the moral of the story is. Remind them that the MoralOf a story is what that story aims to teach. 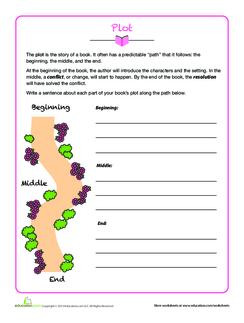 Distribute Character Map worksheets to the class. Go over the directions of the worksheet. Have each student choose either the captain or the crew for his character map. Explain that students will need to explain how their chosen characters felt at different points in the story. Model the process of filling out one of the sections. For example, you can say that in the beginning, the crew was excited and joyous as they played music. Have students work independently on their worksheets. Circulate the room, and provide support when needed. Collect the sheets once time is up. 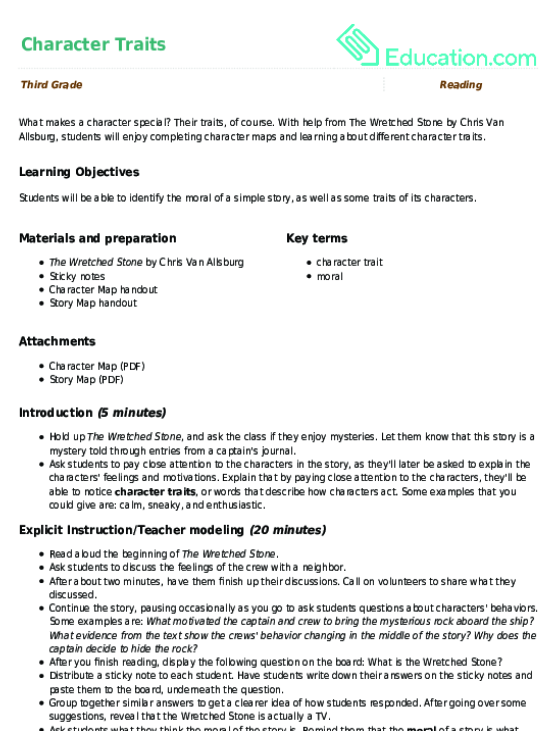 Enrichment:Students who complete their Character Map worksheets early can be assigned the Story Map worksheet. 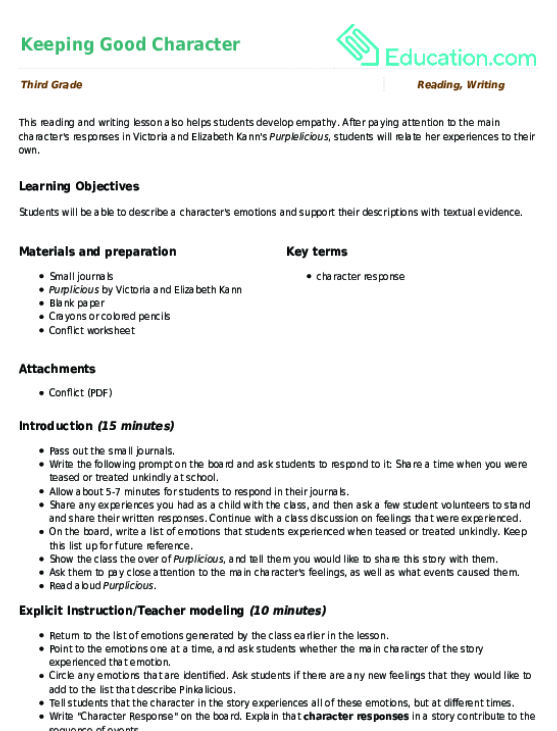 Support:Students in need of support can be asked to create illustrations of their character's actions at different points in the story. Instead of writing descriptions of the character's feelings and motivations, they can describe their illustrations instead. While doing this, they will gain some insight into how the characters may have felt. Monitor students as you circulate the room. Note down any common difficulties that you notice them facing. 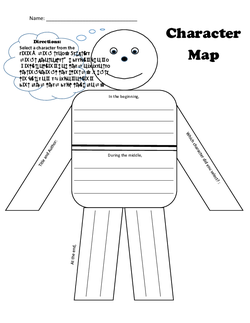 Review students' character maps later to assess their understanding of the lesson content. Have the class regroup and discuss the following question: Has there ever been a time in your life when you felt like the crew did at the end of the story? Encourage students to share anecdotes among themselves. Understanding who is telling the story is an important skill for young readers. 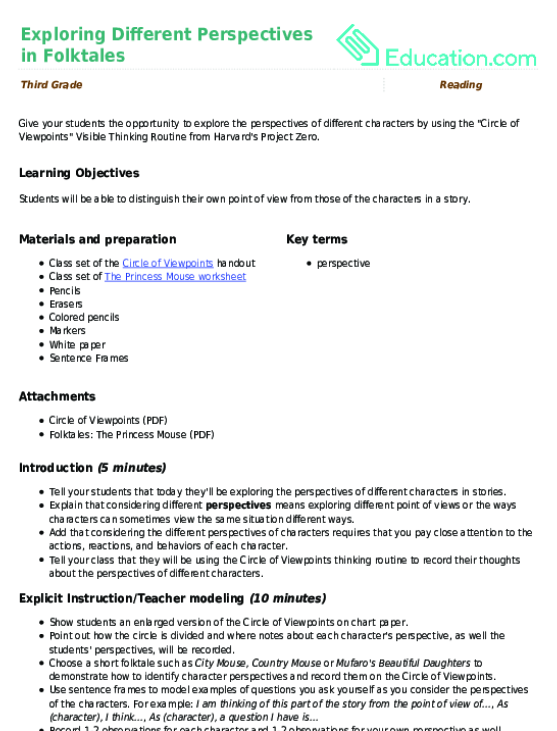 Use this resource with your students to practise distinguishing their own point of view from that of the narrator or characters.